What do you see here? 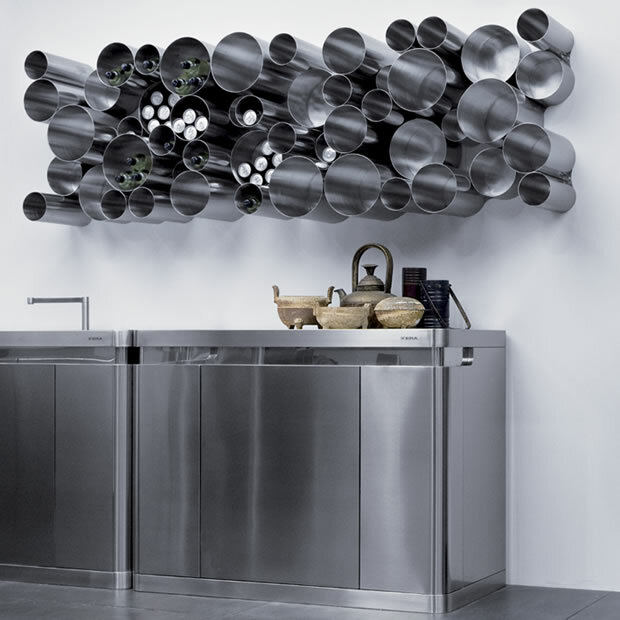 Is this a kitchen, a piece of art or is this the blatant exposure of functional kitchen zones? Each independent zone has a relationship to the other and can be universally configured to the meet the requirements of any individual. 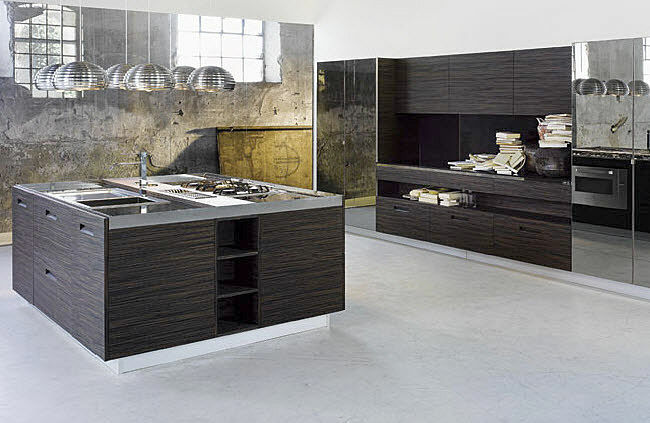 This kitchen is a test, a means of establishing what is important to you! Would you choose this kitchen because it is art or dismiss it because it is unconventional? The answer you choose will have been determined long before the question was asked by considering how you were raised as a child and the social environment in which you now live. Who said that kitchen design wasn’t interesting! 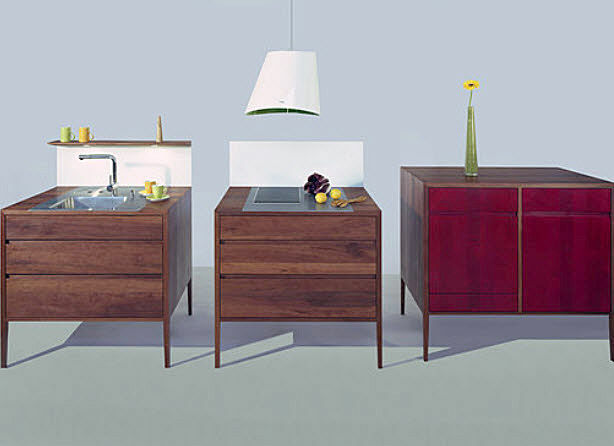 This island has a duel sided focus but can be accessed on all four sides by multiple users. 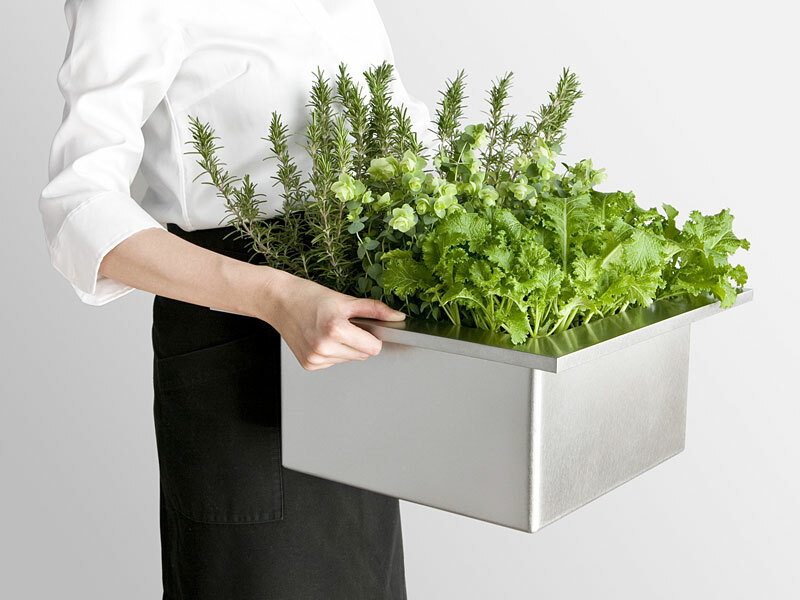 It contains the cleaning, preparation and cooking zones and is a powerful example of how the kitchen can no longer be defined or restricted by the surrounding architecture. The tall units in the background appear more suited to a conventional living space and the mirrored panels create an architectural illusion reflecting the kitchen island and amplifying its presence. It is also interesting to see how the 4 sides of this functional magnet have been given two different finishes with the doors rising up on two sides past the worktop edge to meet a stainless steel lip. This lip detail prevents water or ingredients running off the worktop and onto the kitchen doors. 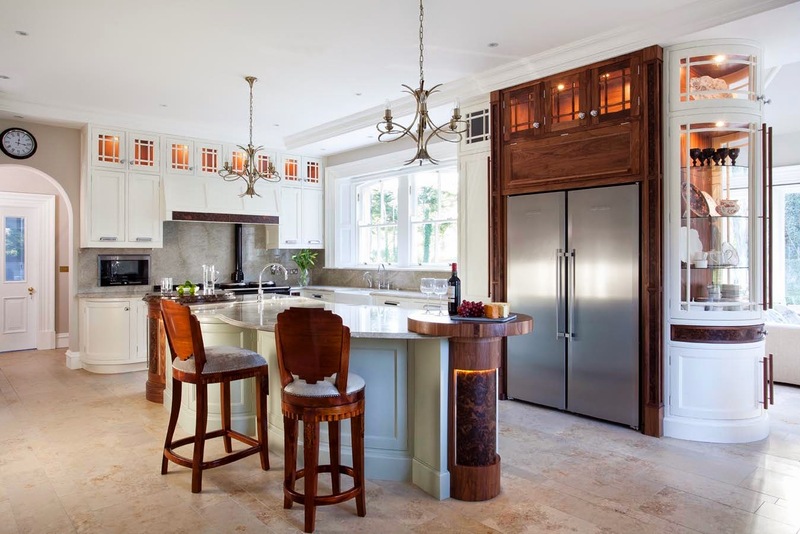 It is argued that the kitchen has become the focal point of the home, the ultimate functional and architectural style influencer, the provider of family sustenance and the catalyst for human interaction. It could be imagined that this mantle of responsibility needs an imposing kitchen superstructure in order to dominate the space and the humans who live within it. But sometimes small and understated can be equally as powerful as carefully chosen words spoken softly. The focus of this design is not its size but instead the quality, precision and focus of the design. If this design had been manufactured in a different material it would not have had the same presence. 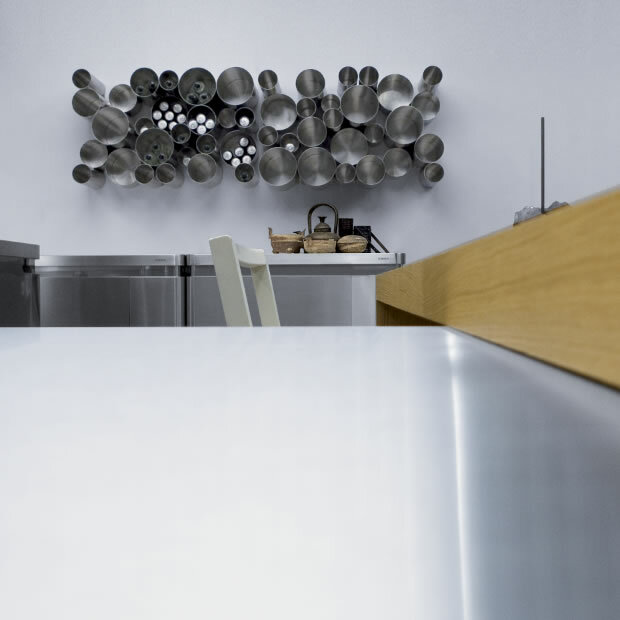 Using stainless steel gives this kitchen all the industrial authority of a precision tool and it modest size only makes the onlooker more curious about its potential! The gravity defying cantilever provides a social twist to the design and adds the appropriate amount of aesthetical contrast. This petite kitchen which is beautifully perched in an understated pose would certainly have its functional limitations if you were keen on throwing dinner parties but if you were well prepared it could still do the job. 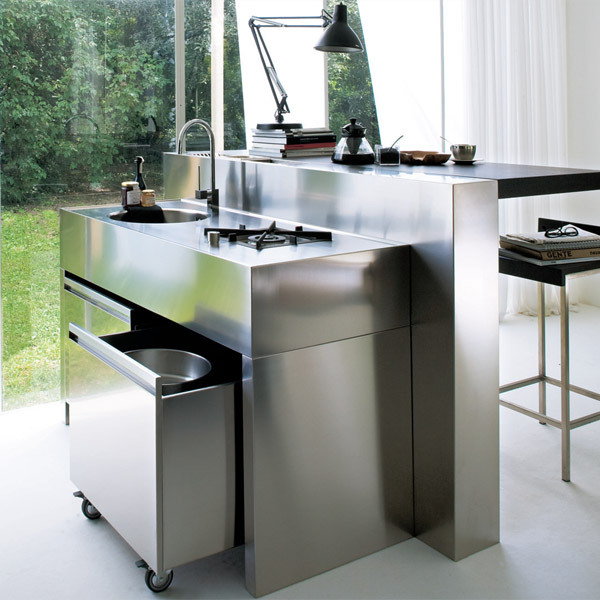 This is a truly beautiful kitchen specimen but The Mogul can’t help feeling that the casters, however functional, detract from the design, giving this residential kitchen a hospital catering feel! Who said that grey was dull! It can be rich and warm and is currently quite trendy!! 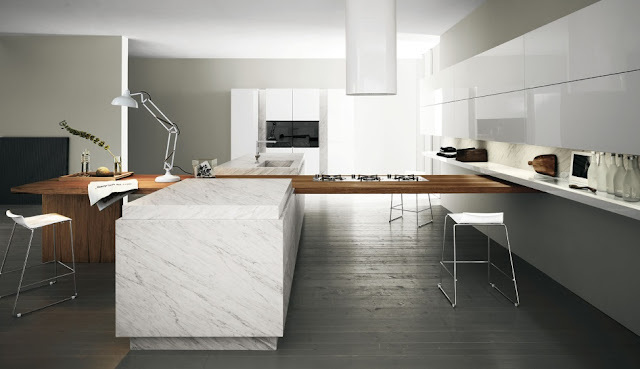 Who said that kitchen design was simple! Not only are the best designers considering functionality, interior design, architecture, technology, sociability and individual style preferences but they are also doing their bit for the planet and bringing the outdoors, indoors! 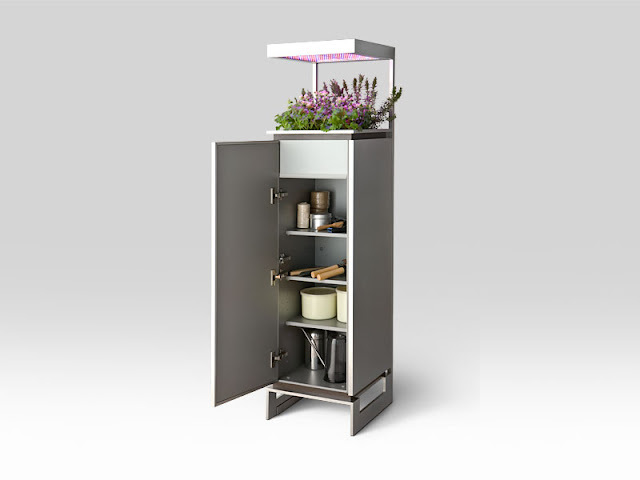 This kitchen comes complete with a versatile herb garden which can be removed if necessary. The design uses state of the art LED technology to promote photosynthesis, encouraging the growth of your kitchen garden. It could be argued that this unique feature provides a holistic element to the design offering the ultimate personal satisfaction to green fingered clients and adding the colour and fragrances of nature into your own personal space. 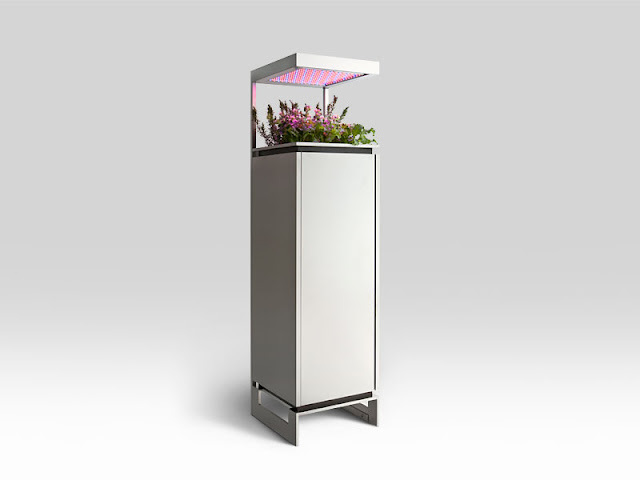 That has to be good, with the successful garden encouraging a sense of achievement and calm! 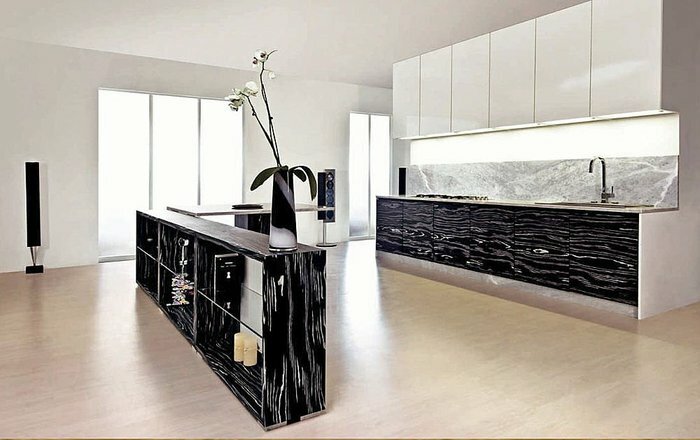 The kitchen has actually become an island, and the island kitchen presents an opportunity for functional and artistic self expressionism! The three arms of this design reach out towards the surrounding architecture longing for a physical connection to the structural boundaries that have historically manipulated and constrained its development. But this metaphor of historical reflection is only a symbolic gesture, as this design is also expressing its new found freedom, its ability to stretch and control an open plan space and encourage the seamless integration between sociability and function! This kitchen island has no sides and is coming out....with pride! 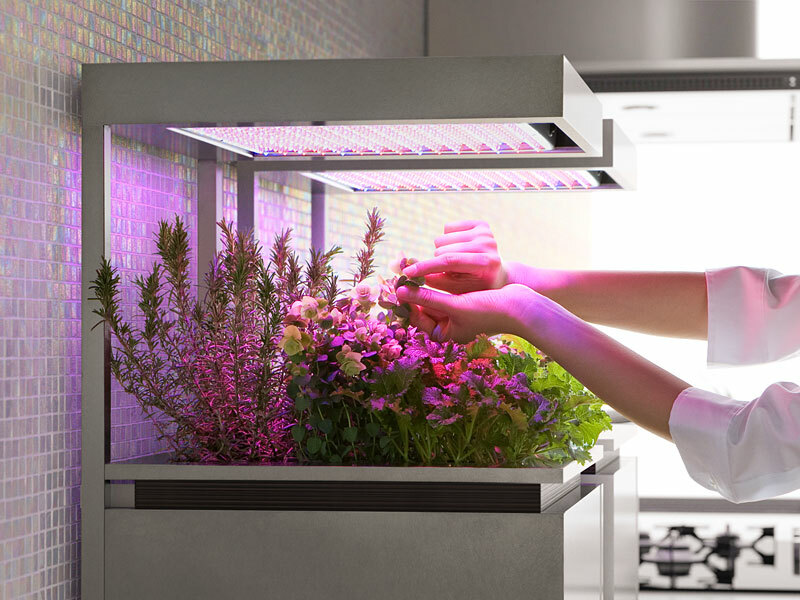 It is also interesting that by looking back in time and considering the design path that has liberated the kitchen you are also seeing into the future! Is it also coincidental that this island is shaped like a flux capacitor!? 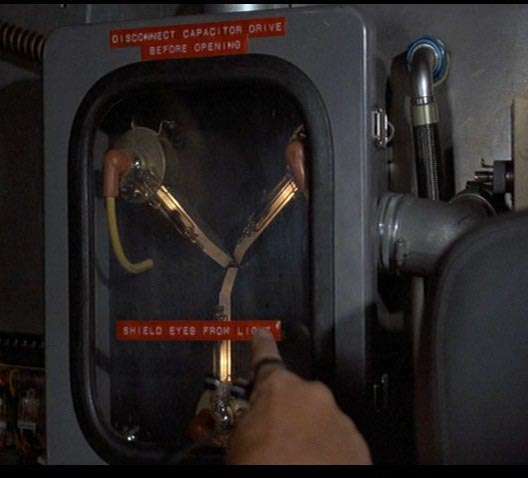 Maybe the appliances run on 1.21 gigawatts of power! If you read Kitchen Design Think Tank you might say that there is nothing unusual here! Some classically styled architecture with a neutrally coloured monolith island and a transforming tall unit section in a flamboyant contrasting colour! We have seen it all before! But this is the first time that The Mogul has seen a kitchen with an integrated diving board! When products work well you can take them for granted not noticing their efficiency or the level of convenience they offer. However, if a problem arises it can become an iconic irritation in your life. A dread that plays on your mind; a regret that can destroy your decision making confidence! Imagine this scenario, you get up every morning for work, get dressed, have your breakfast and go outside only to find that your car won’t start! Would you begin to regret buying it! Probably! And each morning, even after you have had it fixed you would still question its reliability and your own ability to make purchasing decisions! So imagine how irritating it would be to find that even before you make it to your un-reliable car, your kitchen decides to let you down as well! Every kitchen design, no matter how artistic and aesthetically pleasing should have a natural flow, an unspoken pattern that assists the user. The positioning of the sink and hob tops in this design means that the user must walk around the island every time they want to use the ovens or collect produce from the consumables zone. An island should create an opportunity to assist functionality but in this instance it has become an obstacle! Bad functional design will soon become an unbelievable frustration soon after the social joy of having a new kitchen has faded. 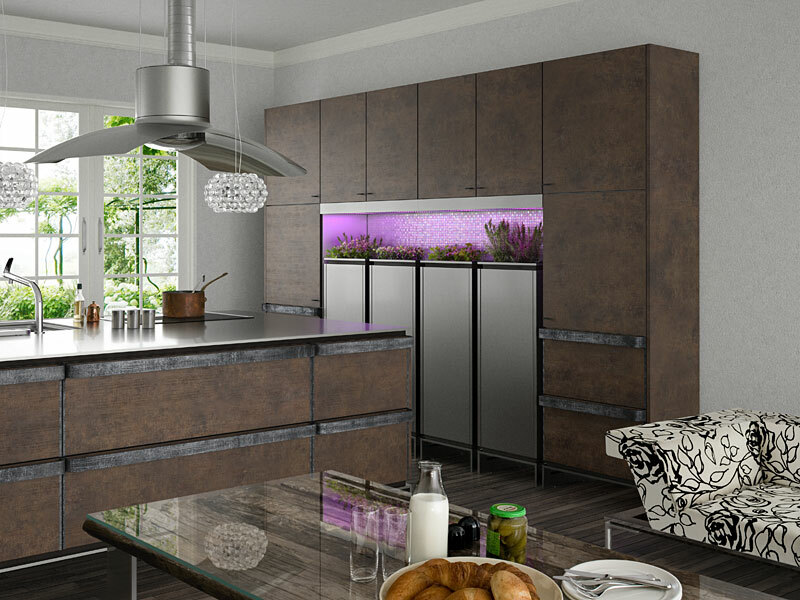 It is so important to invest in good kitchen design because it has the ability to enhance your life....and if you have invested in good design...you probably haven’t even noticed! This is an imposing kitchen, a dominant example of stylish functionalism that has the ability to cause gasps of social envy and cause the surrounding architecture to pale into insignificance in its presence. The island dominates the space and the trendy timber bridge element sinks into the heavy set worktop as though it is a heated wafer and the island where raspberry ripple ice cream! The design ticks a lot of boxes offering sociability and visual gratification in equal measure but The Mogul must question several elements of the design. The bridging element, although a marvel of technical achievement having concealed the services to the hobs within what appears to be a piece of solid wood, does divide the kitchen in two! This imposing border effectively makes half of the kitchen inaccessible to the kitchen user. There is a great deal of this kitchen, most of the foreground in-fact that is dedicated to servicing non-cooking activities. Could it be argued that this design should be more functionally sympathetic and that there has been a luxurious promotion of aesthetical ideology here? You decide! This design presents the eye with a vision of contemporary elegance, a reminder that it is okay to mix materials and door profiles in order create the correct contemporary temperature. Some of us still get chills at the thought of contemporary kitchen design, remaining steadfast in the belief that natural materials are best, more wholesome and heart-warming. 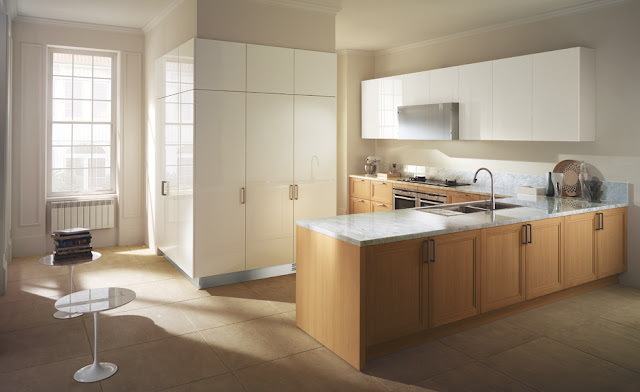 By introducing soft pastel colours and mixing high gloss white and oak shaker doors this design refuses to be categorised as classical or contemporary. There is a great balance here offering a reassuring longevity to the design while still presenting a socially acceptable amount of kitchen fashion. The white lacquered doors provide a trendy backdrop to the functional space and do not overpower the aesthetics. 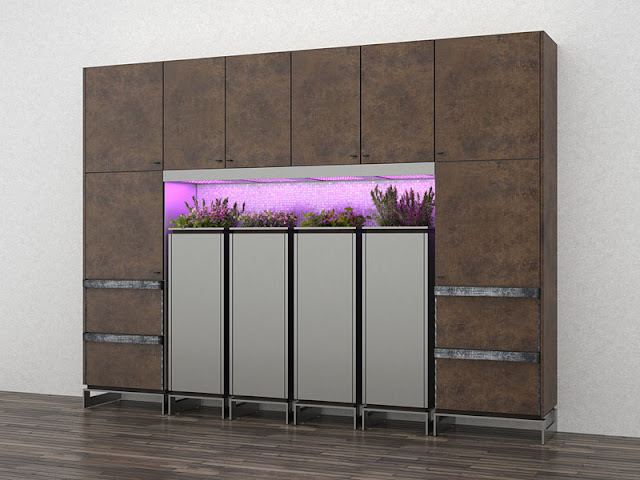 The Mogul particularly loves how the tall units provide the design with depth, wrapping the corner with stylish storage space while remaining introverted and unobtrusive against the classical architecture. Is this the ultimate fusion of architecture and kitchen? 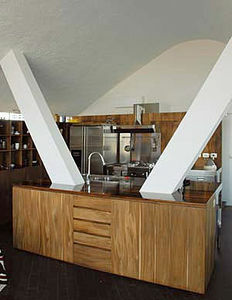 Or does this intimate connection illustrate the dramatic suppression of kitchen design by the powers of architecture? Neither! This is just a really tricky brief!